I've been writing at this blog for years. Like seven or eight. A long time. And I've never had a sizeable readership. Now I didn't begin (nor do I continue) writing here in order to be a famous blogger with an avid reader base. I write because it is good for my soul, I need a place to process my thoughts, and I am hopeful to engage with a few others in real, honest, and thoughtful conversation. But deep down my ego still wonders if anyone cares and I find myself periodically checking the readership stats for my blog. As expected, for most of my blogging life, no one has cared. As you can see, in the seven or eight years in which I have been writing at this site, I have had a total of about 29,000 visitors to my site. That's not much. Some bloggers have hundreds of thousands of pageviews per month. 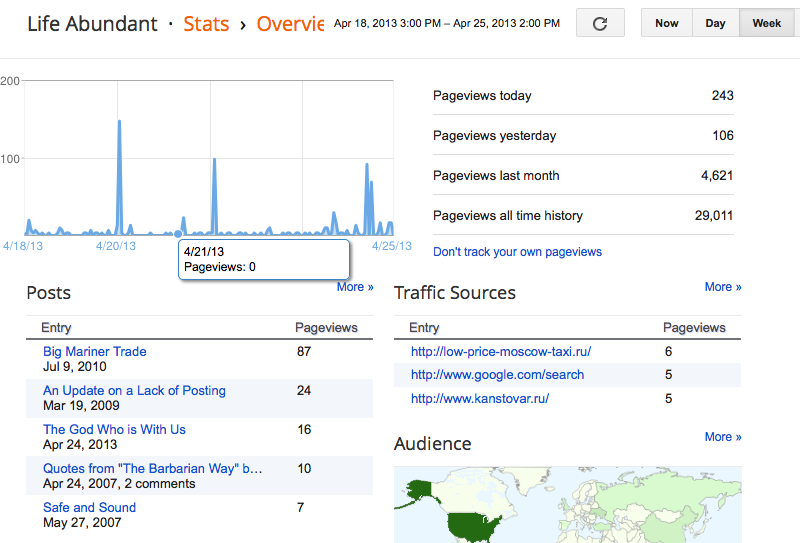 But take a look at my pageviews for the past month - 4,621? What the what? That's a huge increase. Why are people visiting more frequently - and who are these visitors? I haven't even been blogging very regularly. Surely some of the increase is a result of Facebook. When I first started this blog, my posts would automatically export into a Facebook note. 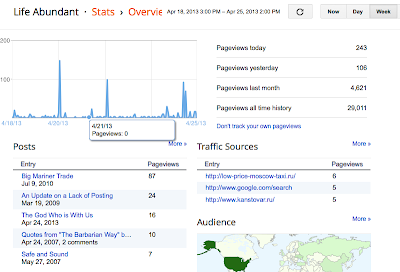 So people could read my thoughts without ever having to visit my actual blog. But now Facebook has changed and I simply have to link to my new blog posts as a status update. But not all of these new visitors are from Facebook. Some are reading posts from 2009 about my irregular posting. Some are reading posts about the 2010 Seattle Mariners. Why? That's strange. I realize that this is a highly uninteresting post to EVERYONE but me, so I applaud you for reading this far. I'm sorry for wondering aloud (or as I type). But it's just a strange occurrence in the life of this blog and I thought I should share the oddity with my (ever-increasing?) readership.